Happy Humpday, my friends! I hope that you’re having an awesome week so far! 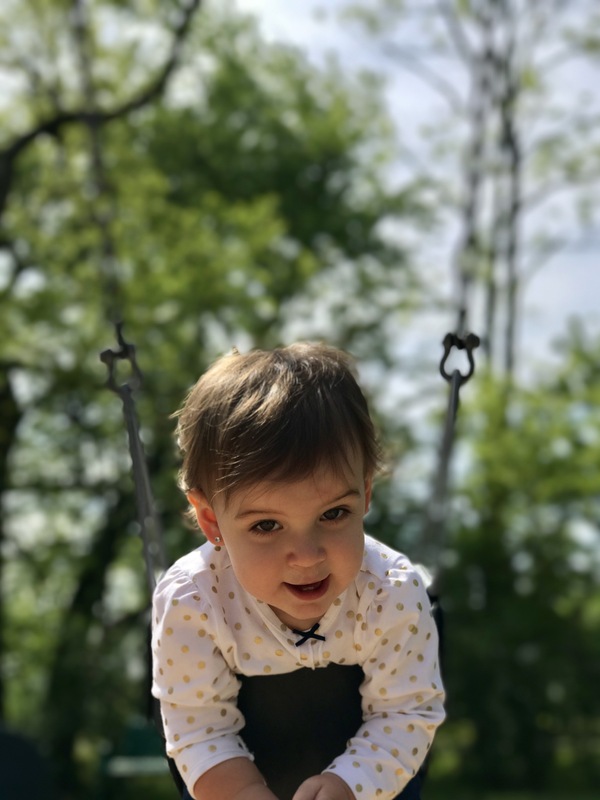 It is finally feeling a little more like spring today, so we were able to enjoy sometime outside at the park and the farmers market! I try to leave my Wednesdays a little more open to give ourselves a little mid week lovin’ and do some fun things together! 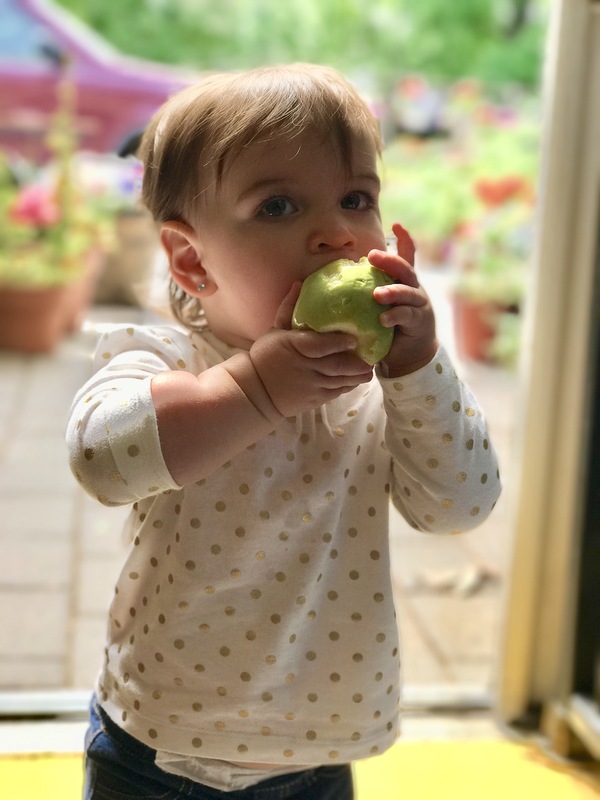 We are so blessed to Highlands Orchard just minutes away from our house. It is a cute little family run farm that sells their own and local fruits and vegetables, local organic meats, eggs and cheeses, some natural household and beauty products, delicious prepared foods and desserts, flowers, herbs, and other speciality items! I love it even more now that I get to take Delaney! Everyone that works there is so sweet and helpful. They love educating Delaney (and I) about all the “farm stuff” and she loves pushing around the shopping carts while eating an apple. Not to mention They have a pig, bunny, chickens, goats and huge peacock that she loves to go and see! Going to the farmers market always gets me really excited and some creative juices flowing. I picked up a few things while I was there and while feeding Delaney I started brainstorming lunch. I picked up some JUICY organic strawberries and spinach while I was there and while I am typically not a huge fan of strawberry & spinach salads, my purchases had me craving one for lunch! 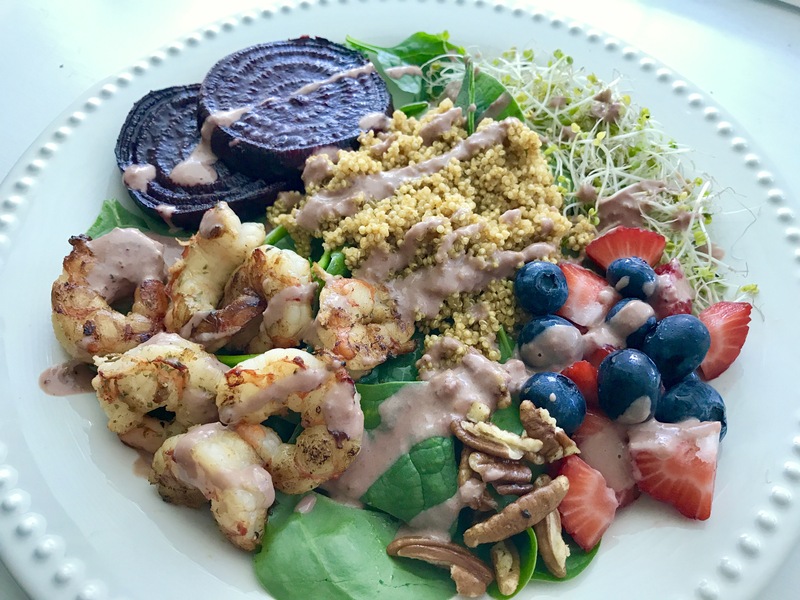 When deciding on a dressing, I got the idea for a strawberry tahini dressing and headed to the kitchen to whip something up! 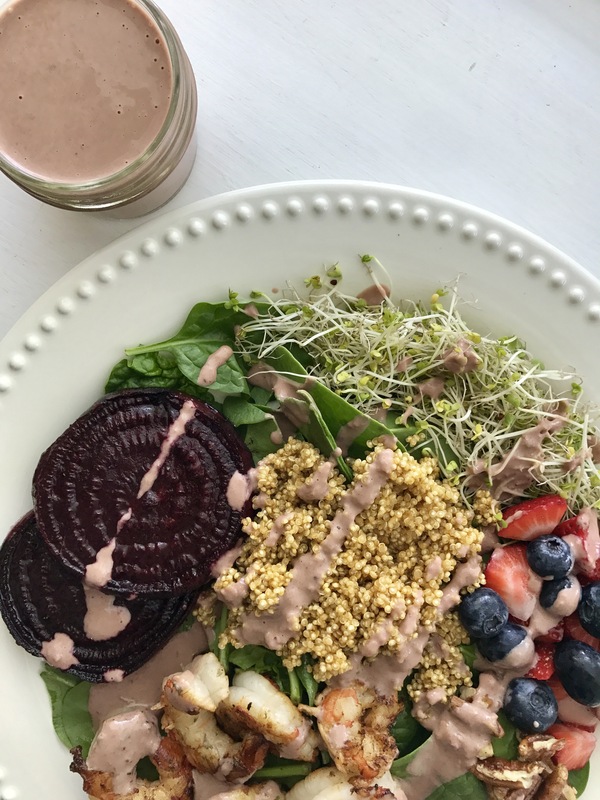 I knew I had shrimp in the freezer, so I decided I would throw that on their for a quick protein, added more berries, pecans, roasted beets, sprouts and some quinoa. This salad is packed with superfoods and a perfect balance of carbohydrates, protein and fats with a good mix of savory and sweetness! For the salad you can pretty much use what you have on hand! I loved this mixture! The amounts for the salad is for one, but the dressing makes a good bit and can last in the refridgerator for a 1-2 weeks!